Pebble Technology, Corp., Pebble Devices, Corp in California. Pebble OS; uses a customized FreeRTOS kernel. Can communicate with Android and iOS apps using Bluetooth. Portions of Pebble OS are closed source. Pebble Time series: 50 slots for faces/apps stored on watch, infinite can be loaded from the connected phone. Pebble Classic series: 8 slots for apps/watch faces, 100 KB per slot for a total of 800 KB user accessible space. The Kickstarter version has 4 MiB (32 Mibit) flash. Originals built after October 2013 and all Steel watches have 8 MiB (64 Mibit) flash. Pebble Classic/Steel: 1-bit black-and-white transflective LCD; Pebble Time: 64 (6-bit) color e-paper. Pebble is a discontinued smartwatch developed by Pebble Technology Corporation. Funding was conducted through a Kickstarter campaign running from April 11, 2012, through May 18, 2012, which raised $10.3 million; it was the most funded project in Kickstarter history, at the time. Pebble began shipping watches to Kickstarter backers in January 2013. Pebble watches can be connected to Android and iOS devices to show notifications and messages. An online app store distributes Pebble-compatible apps from many developers including ESPN, Uber, Runkeeper, and GoPro. A steel-bodied variant to the original Pebble, the Pebble Steel, was announced at CES 2014 and released in February 2014. It owns a thinner body, tactile metal buttons, and a Corning Gorilla Glass screen. It comes in 2 variations: a black matte finish and a brushed stainless steel finish, with both a black leather band and a matching steel band. In 2015, Pebble launched its second generation of smartwatches: the Pebble Time and Time Steel. The devices were similarly funded through Kickstarter, raising $20.3 million from over 75,000 backers and breaking records for the site. In 2016, Pebble shut down their subsequent Time 2 series watches and refunded Kickstarter backers, citing financial issues. On December 7, 2016, Pebble officially announced that the company would be shut down and would no longer manufacture or continue support for any devices, nor honor any existing warranties. Pebble's intellectual property was purchased by Fitbit, a wearable technology company specializing in fitness tracking, who also hired some of the Pebble staff. Further clarification on the transition timeline and efforts to render Pebble OS and its watchfaces/apps more self-sufficient was posted to the Pebble Dev Blog on December 14, 2016. Support for the Pebble app store, online forum, cloud development tool, voice recognition, and voice replies ceased in June 2018, although support for some online services was restored by the unofficial "Rebble" community. The original Pebble Smartwatch was designed based on a concept by Eric Migicovsky describing a watch that could display messages from a smartphone and select Android devices. Migicovsky successfully took his idea through the Y Combinator business incubator program, and unusually for a startup company at Y Combinator, Migicovsky's business actually generated revenue during the program. Migicovsky was able to raise US$375,000 from angel investors such as Tim Draper of Draper Fisher Jurvetson, but was unable to raise additional funds. Discussing his inability to raise further funds, Migicovsky told the Los Angeles Times, "I wasn't extremely surprised... hardware is much harder to raise money for. We were hoping we could convince some people to our vision, but it didn't work out." After raising venture capital for the product under their former name, Allerta (which had already developed and sold the inPulse smartwatch for BlackBerry devices), the company failed to attract traditional investors under their new Pebble brand name, so the company pursued crowd funding in April 2012. Migicovsky's company, Pebble Technology, launched a Kickstarter campaign on April 11, 2012, with an initial fundraising target of $100,000. Backers spending $115 would receive a Pebble when they became available ($99 for the first 200), effectively pre-ordering the $150 Pebble at a discounted price. Within two hours of going live, the project had met its $100,000 goal, and within six days, the project had become the most funded project in the history of Kickstarter to that point, raising over $4.7 million with 30 days left in the campaign. On May 10, 2012, Pebble Technology announced they were limiting the number of pre-orders. On May 18, 2012, funding closed with $10,266,845 pledged by 68,929 people. At the time, the product held the world record for the most money raised for a Kickstarter project. Pebble worked with consulting firm Dragon Innovation to identify suppliers and manufacturers. After overcoming manufacturability difficulties with the prototype design, Pebble started mass production with manufacturer Foxlink Group in January 2013 with an initial production of 15,000 watches per week. Shipping was originally expected to begin September 2012, but Pebble Technology encountered manufacturing difficulties and began shipping units on January 23, 2013. Pebble shipped 300,000 units by December 2013 during its first year of production, over 400,000 by March 2014, 450,000 as of July 2014[update], 1 million by December 31, 2014 and 2 million by December 7, 2017. Pebble can display notifications when, for example, one receives an email. A Pebble attached to a bike, displaying cycling speed, distance, and time. Pebble smartwatch size compared to UK's 50p coin and standard silicone wristband. The watch has a 32-millimetre (1.26 in) 144 × 168 pixel black and white memory LCD using an ultra low-power "transflective LCD" manufactured by Sharp; it contains a backlight, vibrating motor, magnetometer, ambient light sensors, and three-axis accelerometer. It can communicate with an Android or iOS device using both Bluetooth 2.1 and Bluetooth 4.0 (Bluetooth Low Energy) through Stonestreet One's Bluetopia+MFi software stack. Bluetooth 4.0 with low energy (LE) was not initially supported, but was later added through a firmware update in November 2013. The watch is charged through a modified USB-cable that attaches magnetically to the watch to maintain water resistance capability, with a reported seven-day battery life. Water-resistance was added during development based on feedback from Kickstarter backers. The Pebble has a waterproof rating of 5 atm, which means it can be submerged down to 40 metres (130 ft), and has been tested in both fresh and salt water, allowing the user to shower, dive or swim while wearing the watch. As of February 2014[update], the Pebble app store contained over 1,000 applications. Applications included notification support for emails, calls, text messages and social media activity; stock prices; activity tracking (movement, sleep, estimates of calories burned); remote controls for smartphones, cameras and home appliances; turn-by-turn directions (using the GPS receiver in a smartphone or tablet); display of RSS or JSON feeds; and hundreds of custom watch faces. The Pebble was originally slated to ship with its apps pre-installed, including a cycling app to measure speed, distance, and pace through GPS, and a golf rangefinder app supporting more than 25,000 courses. These apps use data received from a connected phone for distance, speed and range information. More apps are downloadable via a mobile phone or tablet, and an SDK is freely available. Not all apps were pre-installed when the watch was originally shipped, but CEO Eric Migicovsky announced on January 9, 2013, that updates for the watch's operating system would be released every 2–3 weeks until all features were added. Pebble integrates with any phone or tablet application that sends out native iOS or Android notifications including from any app, including text messaging and phone call apps. The watch's firmware operating system is based on a FreeRTOS kernel and uses Newlib, the STM32 Peripheral Lib, the Ragel state machine compiler, and an unnamed UTF-8 Decoder. Gadgetbridge is an alternative companion application for Android. It is open source, does not require account creation, and supports features such as notifications, music playback and watch application installation/removal. Linux users can access the Pebble using libpebble's tools enabling experimental alpha level services with several Linux distros including the Maemo OS Nokia N900. There is also a commercial app called Rockwatch for the Meego Linux OS Nokia N9 that provides services including managing the Pebble's firmware and apps running on the watch. Pebble Technology announced that an open Pebble software development kit (SDK) would be released before shipment of the watches began. A proof-of-concept watchface SDK and documentation were released on April 12, 2013. The released SDK was limited to development for watch faces, simple applications, and games. The second release of the SDK (renamed PebbleKit) was released on May 17, 2013, and added support for two-way communication between Pebbles and smartphones running iOS or Android via the AppMessage framework. The original Pebble Smartwatch was released to mixed reviews. The design was acclaimed for being innovative. CNET praised the design, readability, and water-resistance of the Pebble Steel, but criticized the limit of eight user-installed apps and the lack of a heart-rate monitor. Later watches in the Pebble series were described similarly—as simple and effective but lacking some features of competitors like the Apple Watch. On February 24, 2015, Pebble announced the Pebble Time, their second-generation Pebble smartwatch via its Kickstarter campaign. The Pebble Time Steel is a stainless steel variant of the Pebble Time smartwatch, available in multiple finishes: silver, black or gold with either a leather or steel band. Pebble claims it has a 10-day battery life. The Pebble Time Round is also made of stainless steel and 2.5d gorilla glass with five finishes. Pebble claims it has a 2-day battery life, dramatically decreased because of the shape and size but still significantly longer-lasting than the Apple Watch's 16-hour life. Pebble's second generation comes with various improvements over its predecessors, such as a 64-colour e-paper display with Gorilla Glass a thinner and more ergonomic chassis, plastic casing and a microphone. The Pebble Time retains the seven-day battery life and water resistance found on the previous two Pebble watches. It has a 150mAh battery. Alongside the Pebble Time Steel, Pebble announced its open hardware platform called "Smartstraps". This lets developers develop new third-party straps that connects to a special port at the back of the watch and can add new features like GPS, heart rate monitors, extended battery life and other things to the watch. This new platform prevents smartwatch bloat and making the watch bulky like most of its competitors' smartwatches. The Pebble Time also includes a new interface designed around a timeline, which is similar to what is found in Google Now on Android Wear. In December 2015, all old Pebbles got a firmware update, enabling support for the timeline and removing the maximum of 8 apps-restriction, letting additional apps load directly from the connected phone. It is backwards compatible with all previous apps and watch faces. Third parties have created apps for Pebble Time, such as contactless payment (tap to pay). The Pebble Time retailed for $199. The project reached its Kickstarter funding goal of $500,000 in 17 minutes. The project took 49 minutes to reach $1 million, which is a Kickstarter record. The project raised $10.3 million in 48 hours, another Kickstarter record. On March 3, 2015, Pebble Time became the most funded Kickstarter ever with nearly $14 million funded, while having 24 days left in its campaign. At the end of the funding, March 27, 2015, Pebble Time received pledges of $20,338,986 from 78,471 backers. Pebble 2, the company's 3rd generation smartwatch, launched on Kickstarter on May 24, 2016 with an offer period of 36 days at discounted introductory pricing, and shipment of the new models anticipated in the October–November 2016 timeframe. Among the new features was a heart rate monitor and speaker, along with waterproofing. Many new features were documented as part of the Kickstarter prospectus, while other technical specifications of the forthcoming products are not yet disclosed. The Pebble 2 product line added a new device called the Pebble Core, "a tiny wearable computer with Android 5.0" featuring a 3G modem, GPS, and Spotify integration backed by an open development community. Pebble 2 was officially released in September 2016 with a new design and functions at $129. When Pebble sold parts of its company to Fitbit in late 2016, Gizmodo criticized the company for collecting $12.8 million in the product's Kickstarter and delaying shipments for half a year without being forthright with their supporters. Kickstarter backers who have not received the product are expected to receive refunds in 2017. On December 7, 2016, Pebble Technology filed for insolvency with Fitbit acquiring much of the company's assets and employees. The selling of Pebble brand to Fitbit was credited to Charles River Ventures who invested $15 million in the company in 2013. The purchase excluded Pebble's hardware, as stated by Fitbit. The deal was focused on Pebble's software engineers and testers, and the acquisition of intellectual property such as the Pebble watch's operating system, watch apps, cloud services, and its patents. Fitbit paid $23 million for Pebble's intellectual property, despite Pebble's debt and other obligations exceeding that. Fitbit did not take on Pebble's debt. The remainder of Pebble's assets, including product inventory and server equipment, was set to be sold off separately. Following the acquisition, Pebble's offices were closed and Fitbit held control over the use of the Pebble brand. The former Pebble engineers were relocated to Fitbit's offices in San Francisco. As a result, Pebble was forced to cancel shipments for its Pebble 2, Time 2, and Pebble Core smartwatches, refunding Kickstarter backers. As of November 2018, Pebble's website, pebble.com, redirects to Fitbit's website. An unofficial developer group called Rebble was created to extend support for the Pebble watches' online services that were discontinued on June 30, 2018. Pebble users and enthusiasts created the Rebble.io website in December 2016 following the announcement of Pebble's shutdown. Users can switch their devices from the original Pebble web services to the Rebble Web Services to restore some of the lost features; some features require a monthly subscription to cover the costs. ^ a b Milian, Mark (September 16, 2013). "The Sticky Situation That Delayed the Pebble Smartwatch". Bloomberg L.P. Archived from the original on May 2, 2017. Migicovsky signed an agreement with Taiwan-based Foxlink Group to assemble the Pebble! watches in a plant near the southern Chinese city of Shenzhen. ^ "The Pebble is now even cheaper". Compare Smartwatches. Archived from the original on 2014-10-11. Retrieved 2014-10-07. ^ a b c d "Pebble – Pebble's Next Step". 2016-12-07. Retrieved 2018-10-13. ^ a b "Pebble smart watch review – hands on". Expert Reviews. Archived from the original on 2013-08-15. Retrieved 2013-09-05. ^ Murray, Brad (May 23, 2014). "FreeRTOS™ Code Revisions from Pebble". Archived from the original on August 21, 2014. ^ Migicovsky, Eric (May 22, 2014). "Eric Migicovsky on Twitter". Archived from the original on July 15, 2015. Our proprietary code is not open source though. ^ "What is Pebble's (and Steel's) actual amount of Memory and Storage (RAM and ROM)?". May 15, 2014. Archived from the original on March 4, 2017. ^ a b "Pebble Teardown". iFixit. Archived from the original on March 15, 2013. Retrieved March 19, 2013. ^ "OET Exhibits List for FCCID RGQ-PEBBLE-WATCH, Internal Photos". FCC. December 27, 2012. Archived from the original on April 20, 2016. ^ Detwiler, Bill (June 16, 2014). "Cracking Open the Pebble Steel". Archived from the original on August 19, 2014. ^ "OET Exhibits List for FCCID RGQ-PEBBLE-WATCH2, Internal Photos". FCC. January 6, 2014. Archived from the original on April 20, 2016. ^ "FCC OET Exhibits List for FCCID RGQ-PEBBLE-WATCHA, Internal Photos". FCC. October 18, 2013. Archived from the original on April 20, 2016. ^ Galan, Walter (March 12, 2013). "Pebble Teardown". iFixIt. Archived from the original on March 15, 2013. ^ Chang, Alexandra (May 14, 2012). "Hands On With Pebble Smartwatch, the Most Successful Kickstarter Project Ever | Gadget Lab". Wired.com. Archived from the original on September 8, 2013. Retrieved 2013-08-28. ^ FCC Office of Engineering and Technology (December 27, 2012). "OET List Exhibits Report". fccid.io. Archived from the original on April 20, 2016. Retrieved 2013-09-05. ^ Hardawar, Devindraw (January 23, 2013). "Pebble smartwatch now shipping, but expect to wait a while for yours". VentureBeat. Retrieved May 10, 2018. ^ "First Steps Forward with Fitbit". Archived from the original on February 2, 2017. Retrieved April 28, 2017. ^ Goode, Lauren (24 January 2018). "Fitbit will end support for Pebble smartwatches in June". The Verge. Archived from the original on 24 January 2018. Retrieved 24 January 2018. ^ a b c "Rejected By VCs, Pebble Watch Raises $3.8M on Kickstarter". Go.bloomberg.com. April 17, 2012. Archived from the original on April 21, 2012. Retrieved 2012-04-22. ^ a b c Netburn, Deborah (April 18, 2012). "Pebble smartwatch raises $4.7 million on Kickstarter funding site". latimes.com. Archived from the original on April 22, 2012. Retrieved 2012-04-22. ^ "Vancouver-born entrepreneur's Pebble smartphone breaks Kickstarter record". Vancouver Sun. Archived from the original on 2012-05-29. Retrieved 2012-05-12. ^ Anthony Wing Kosner (April 15, 2012). "Pebble Watch for iPhone and Android, The Most Successful Kickstarter Project Ever". Forbes. Archived from the original on April 19, 2012. Retrieved 2012-04-20. ^ "Pebble Smartwatch Pre-Orders Are Sold Out, $10+ Million Pledged". Time. May 10, 2012. Archived from the original on March 4, 2016. ^ Glenday, Craig (2013). Guinness World Records 2014. pp. Pg. 129. ISBN 9781908843159. ^ Cowley, Stacy. "Kickstarter's top projects: When they shipped". CNNMoney. CNN, Fortune, and Money. Archived from the original on 2014-05-20. Retrieved 2014-05-11. ^ Neal, Dave. "CES: Kickstarter funded Pebble watch makes a splash". The Inquirer. Incisive Financial Publishing Limited. Archived from the original on 2013-03-08. Retrieved 2013-03-05. ^ Francis, Don (February 4, 2014). "George Zachary Calls Pebble His Best Investment To Date". Startup Grind. Archived from the original on July 2, 2014. When asked by StartupGrind founder and interviewer, Derek Andersen, about the investment, George called said Pebble has not only been the fastest growing investment based on revenue, but also the most profitable. Charles River Ventures invested $15 million Series A funding in 2013. George confirmed that Pebble had shipped 300,000 units in its first year of operation. ^ Mangalindan, JP (March 20, 2014). "Pebble sold 400,000 smartwatches last year, on track to double revenues in 2014". Archived from the original on August 10, 2014. Retrieved March 20, 2014. ^ Martin, Brandon (February 2, 2015). "Pebble ships more than 1 million units, 2015 models to take on Apple Watch". www.inferse.com. Inferse. Archived from the original on February 13, 2015. ^ Bennett, Brian (January 9, 2013). "Pebble watch is the smartest timepiece ever (hands-on)". CNET. Archived from the original on March 18, 2013. Retrieved March 19, 2013. ^ a b c Migicovsky, Eric (January 9, 2013). "Pebble: E-Paper Watch for iPhone and Android by Pebble Technology " CES Announcement recap". Archived from the original on January 10, 2013. Retrieved January 9, 2013. ^ Pebble Smartwatch | iPhone & Android Smartwatch Archived 2015-09-14 at the Wayback Machine. Getpebble.com. Retrieved on 2014-01-14. ^ "Pebble: E-Paper Watch for iPhone and Android by Pebble Technology " Manufacturing and Software Updates". Pebble Technology. Kickstarter. February 6, 2013. Archived from the original on March 10, 2013. Retrieved March 19, 2013. ^ Migicovsky, Eric (CEO, Pebble) (July 30, 2012). "Why only one connection?". Pebble Technology Corp. Archived from the original on May 22, 2014. Retrieved May 21, 2014. ^ Klug, Brian (November 6, 2013). "Pebble Releases Update _ Better iOS 7 Integration, New APIs, Enables Bluetooth LE". AnandTech. Archived from the original on February 25, 2014. Retrieved May 21, 2014. ^ "Allerta intros Pebble smartwatch, inPulse's attractive younger sibling". Engadget. Archived from the original on 2012-04-20. Retrieved 2012-04-22. ^ "Pebble: E-Paper Watch for iPhone and Android by Pebble Technology " We're waterproofing Pebble!". Kickstarter. Archived from the original on 2012-04-15. Retrieved 2012-04-22. ^ Kim, Eugene (February 26, 2013). "Pebble Smartwatch Review". PC Mag. Archived from the original on June 20, 2013. Retrieved 2013-06-13. ^ Lee, Adriana (February 10, 2014). "10 Cool Things A Pebble Smartwatch Can Do". ReadWrite. Archived from the original on April 13, 2014. ^ Chang, Alexandra (April 11, 2012). "Pebble E-Ink Smartwatch Connects to Your iOS or Android Phone | Gadget Lab". Wired.com. Archived from the original on April 21, 2012. Retrieved 2012-04-22. ^ "Setting Up IOS Notifications". Pebble Technology. October 15, 2014. Archived from the original on November 29, 2014. With the iOS7 Notification Center, Pebble can receive notifications for any apps that you set up to send alerts to your iPhone (4s or later iDevices). ^ Joseph, Pebble's Community Manager (November 20, 2014). "A world of increíble Pebble updates: Firmware, Android, and iOS (Release Notes)". Pebble Technology. With a new foundation to introduce awesome features more easily, version 2.1.0 of the Pebble Android app is here, starting with three magic words: Full. Notification. Support Android devices running 4.3 (Jelly Bean) or above can now send notifications to Pebble from any app, via the new Notifications " All Apps menu. ^ "Pebble: E-Paper Watch for iPhone and Android by Pebble Technology " Developer SDK availability". Pebble Technology. Kickstarter. April 13, 2012. Archived from the original on March 8, 2013. Retrieved March 6, 2013. ^ "Pebble Watchface SDK Release". April 12, 2012. Retrieved April 12, 2013. ^ "Pebble Watchface SDK Documentation". April 12, 2012. Archived from the original on April 15, 2013. Retrieved April 12, 2013. ^ Pebble Watch Review Archived 2014-01-09 at the Wayback Machine. Business Insider (April 17, 2013). Retrieved on 2014-01-14. ^ Pebble Steel review - CNET Archived 2015-02-24 at the Wayback Machine. Retrieved February 24, 2015. ^ Stein, Scott. (January 6, 2014) Pebble Steel – Watches and wrist devices – CNET Reviews Archived 2014-01-09 at the Wayback Machine. Reviews.cnet.com. Retrieved on 2014-01-14. ^ "Pebble an affordable smartwatch in your range". StockNewsDesk. September 17, 2014. Archived from the original on September 22, 2014. ^ Pebble Time Steel launches alongside new smart watch straps Archived 2015-03-10 at the Wayback Machine. Gigaom. Retrieved March 3, 2015. ^ Hoffelder, Nate (April 16, 2015). "Official webpage says it is "1.25-inch, color e-paper display"". Archived from the original on April 16, 2015. Retrieved April 16, 2015. ^ "Pebble Time: The new Pebble color baby". 14 March 2015. Archived from the original on 2 April 2015. ^ "Smart strap brings payments to your Pebble smartwatch". Archived from the original on 2017-01-04. ^ "Pebble Time - Awesome Smartwatch, No Compromises". Kickstarter. Pebble Technology. February 24, 2015. Archived from the original on February 24, 2015. Retrieved February 24, 2015. ^ "Made our @Kickstarter goal in 17 minutes?! Only one thing to say :-D #PebbleTime". Twitter. Pebble Technology. February 24, 2015. Archived from the original on July 1, 2015. Retrieved February 24, 2015. ^ "Pebble's color watch is the fastest Kickstarter project to hit $1 million (updated)". Engadget. February 24, 2015. Archived from the original on February 24, 2015. Retrieved February 24, 2015. ^ Pebble Time most funded Kickstarter ever Archived 2017-08-07 at the Wayback Machine. USA Today. Retrieved March 3, 2015. ^ Pebble Time - Awesome Smartwatch, No Compromises Archived 2015-08-19 at the Wayback Machine Pebble Kickstarter Pebble Project Updates. Retrieved April 30, 2015. ^ KickStarter. "KickStarter: Pebble 2, Time 2 + All-New Pebble Core". KickStarter. Archived from the original on 24 May 2016. Retrieved 24 May 2016. ^ Pierce, David (May 24, 2016). "Pebble's Best Gadget Isn't a Watch". wired.com. Wired. Archived from the original on May 24, 2016. Retrieved May 24, 2016. ^ Tan, Samuel (November 14, 2016). "Pebble 2 Review". heartratemonitorguides.com. HRMG. Archived from the original on November 21, 2016. Retrieved November 14, 2016. ^ Cranz, Alex. "Pebble Is Dead, and Its Customers Are Completely Screwed". Archived from the original on 2017-09-06. ^ "Assignment for the Benefit of Creditors". Archived from the original on 2016-12-07. ^ Orlowski, Andrew. "Who killed Pebble? Easy: The vulture capitalists". theregister.co.uk. Archived from the original on 2017-08-10. ^ "Fitbit, Inc. - Fitbit, Inc. Acquires Assets from Pebble". Fitbit. Archived from the original on 2016-12-07. ^ Goode, Lauren (2017-02-22). "Fitbit bought Pebble for much less than originally reported". The Verge. Archived from the original on 2017-02-23. Retrieved 2017-02-24. ^ Levy, Steven. "The Inside Story of Pebble's Demise". Medium. Archived from the original on 17 February 2017. Retrieved 13 December 2016. ^ "Pebble Time 2 and Pebble Core backers to be refunded". Archived from the original on 2017-02-17. ^ "Fitbit Buys Software Assets From Smartwatch Startup Pebble". Archived from the original on 2016-12-08 – via www.bloomberg.com. ^ Wodinsky, Shoshana (June 15, 2018). "Pebble smartwatches could be kept alive by an unofficial developer group called Rebble". The Verge. Retrieved July 4, 2018. ^ "Rebble is exactly what you need if you don't want your Pebble watch to die". Digital Trends. 2018-06-15. Retrieved 2018-07-04. ^ "Rebble · Ushering in the Rebble Era!". rebble.io. July 1, 2018. Retrieved July 4, 2018. 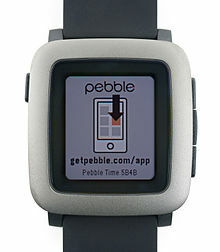 Wikimedia Commons has media related to Pebble E-Paper Watch.